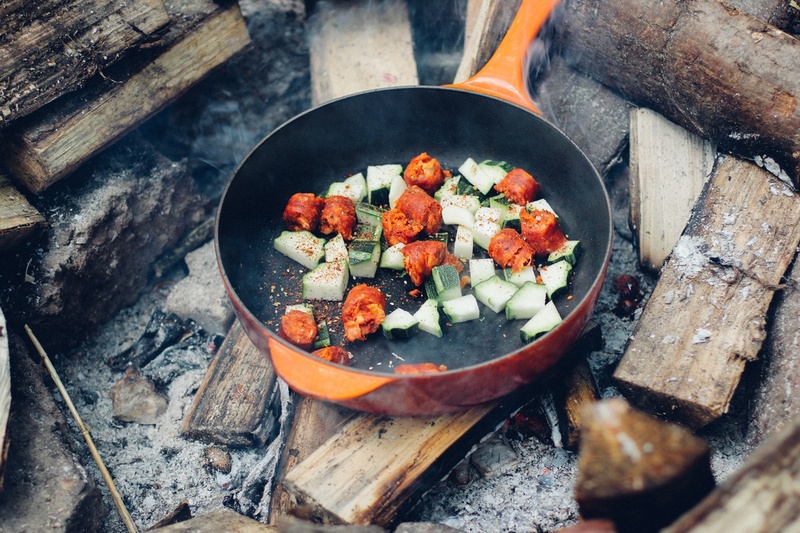 The challenge: cook a delicious camping meal in less than 10 minutes. I hate cooking when camping. I really do. For me, a day off in nature is worth it if I don’t have to cut, fry, boil or bake. But as often happens in life, when you announce in public that you hate something, in a matter of months you’re eagerly swearing by it, only vaguely remembering all the negativity you felt towards it. 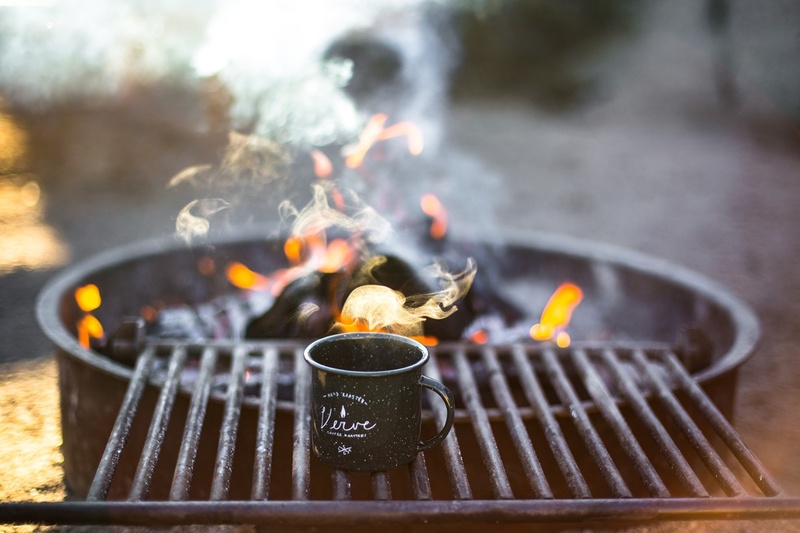 So, now that I have actually started cooking when camping, I’m happy to share my favorite recipes with you. 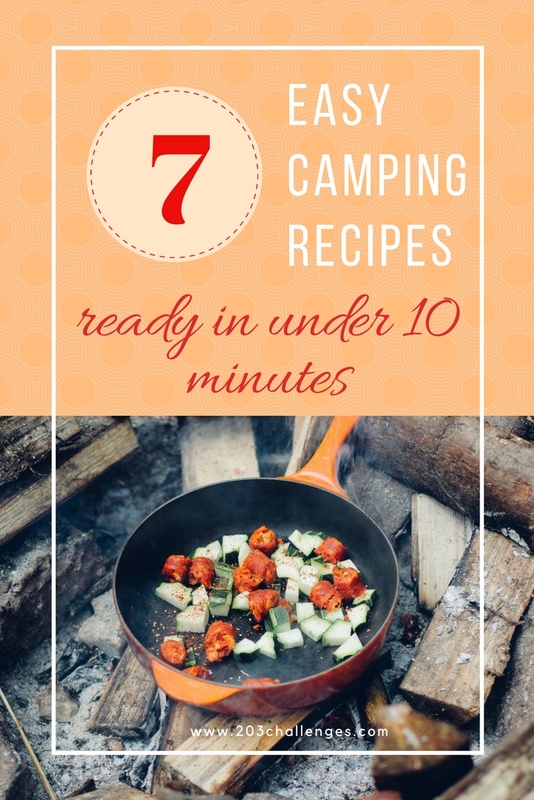 These are in my camping cookbook for one reason only – because all of them require no more than 10 minutes to prepare. Before you leave, cut raw sausages, onions, peppers and other seasonal vegetables, season with some oil, pepper and salt, then put everything into a disposable metal tray. Wrap in foil and keep in a cooler until it’s time to throw it on the fire. Yeah, I know I said I hate frying, but the mere thought of the sweet smell of French toast with my morning coffee is so mouthwatering, that I have surrendered to it. Tip: I beat the eggs and milk in advance and take them in a bottle or a mason jar. The first person to wake up is responsible for preparing the toast in the morning. If there is something I love for a light dinner, it’s a mix of cheese and cured meat served with some fresh fruit and crackers or bread. If you cut everything in advance and pack it in a box, the preparation time drops to two seconds (opening the lid of the box). A favorite Middle Eastern treat, Tabouleh salad is ready in five minutes. You need to soak the couscous in warm or tepid water for five minutes and then mix it with chopped parsley, tomatoes, onions (peppers or mint are optional). Season with extra virgin olive oil, salt, and vinegar. The couscous makes this salad filling yet fresh. This camping classic doesn’t require a cooler. Just choose your favorite beans from a can (black, red, cannellini, chickpeas) and add spring onions, basil, olive oil, salt, fresh red pepper and lemon. (Fanfare!) You haven’t even touched a pot or a pan! Wrap the washed spring potatoes and mushrooms in tin foil (two or three potatoes with two or three mushrooms in a pack). Add oil, salt and pepper, or if you want something more fancy – thyme, rosemary or raisins. Put the foil packs on the grill or on embers (not over the direct fire) to stew in their delicious sauces. #smores banana style. Just stuff a banana with choc and marshmallows and grill! Yummmm!!! *just learned the official name #bananaBoats ! Dessert is here! Without peeling the bananas, make a deep cut along their long side without entirely cutting them in two. Fill the gap with chocolate, nuts, coconut, caramel sauce, honey and other fruits… Combine your favorite flavors for a perfect dessert. 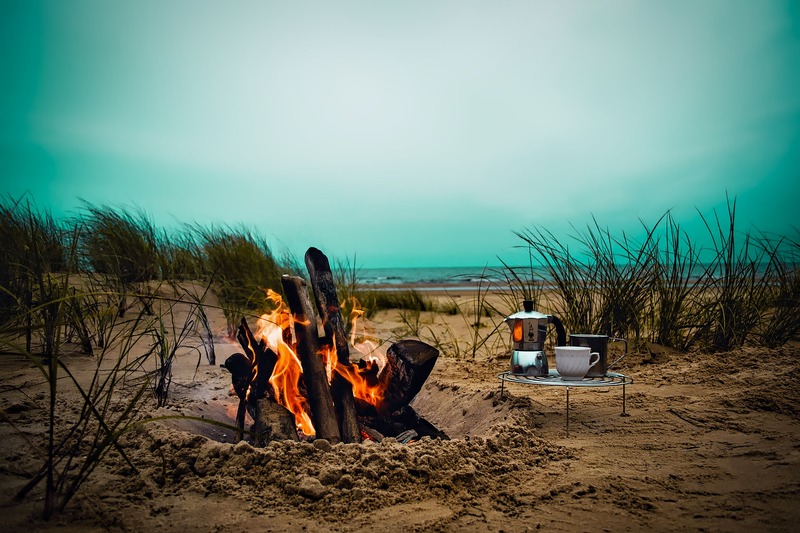 I have never been camping but the Tabouleh salad and the cheese and cured meat sound tasty! Now I want a banana boat~ Thanks for reminding me of how much I love those!